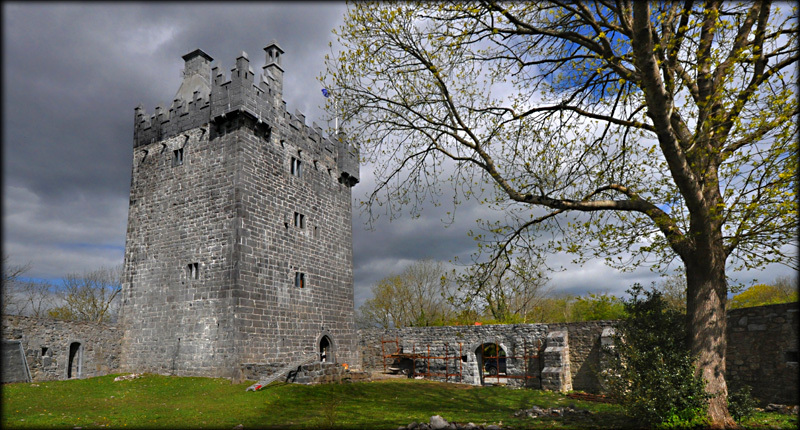 This recently restored tower house picturesquely located on the eastern shore of Lough Corrib was most likely erected by the O'Flaherty Clan in the late 14th century. Unfortunately, little is known of its history. The castle is battered at the base, with a pointed-arch south-facing doorway, and at one time was fortified by a murder hole, although with the recent renovations it was not possible to discern if the murder hole is still present. Prior to reconstruction there were only traces of bartizans at the corners of the south wall and another at the north-east corner, and no crenellations or roof. These items have been reconstructed for the current private dwelling. The east and west gables of the roof remain set back from the level of the main wall. The tower house has been described as five-stories, but in comparing the present structure to photos prior to the reconstruction, the window openings appear to be the same (although windows now fill the gaps), yet only four stories are apparent. From what we could discern, a straight stairway from a small entry chamber leads through the east wall to the first floor, and after that becomes spiral. Two things struck me - one is that although the castle appears quite large, it is amazingly smaller inside when one accounts for the thickness of the walls and the need for staircases in the walls. The other is that a level of care was taken in refitting this castle for modern living -- while the interior is modernized, an attempt was made to reconstruct the exterior back to how it may have appeared when first built. Situated:: Easy. On the eastern side of Lough Corrib. From Galway City take the N84 North towards Headford. After about 12 kilometres take a left turn. (Not signposted) then 3k turn right. Then take a left.